Has there ever been so much pain contained on one side of a T Shirt? I have no doubt that Pinoys know NBA basketball. 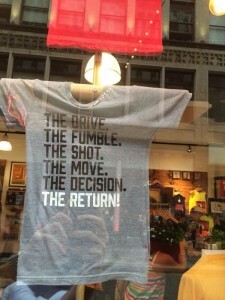 I do doubt that many understand why “The Return” really is a big deal for the city of Cleveland. In the Philippines the whole idea of the home team seems to be so insignificant in what little sports there are here. There are very few significant sporting events outside of “Imperial Manila”. There are very few municipalities that have a sports team that brings them to prominence on a national level. The PBA with their epal model of team loyalty is a turn off for me. Ads may be a necessity in mass media but don’t expect a guy like me to identify a team with a product. I am going to talk about pain and hope. I have never been to Cleveland but from the outside looking in I just have seen so many instances of agony that city has been forced to endure. Over the years I have felt their pain from afar. There was an ESPN article in 2004 that declared Cleveland the most tortured sports city of them all. This was before The Decision of LeBron James. You can Google all the rest but I will just focus on events that happened in my sports fanatic lifetime which happen to be the ones in the real T Shirt being sold in Cleveland now. Back in the late 70s/ early 80s the most competitive division in football was the AFC Central. The Pittsburgh Steelers with the Steel Curtain, Bradshaw, Harris and Noll already won their four Super Bowls. The Cincinnati Bengals were poised to go on a Super Bowl run of their own. behind Ken Anderson and Coach Forrest Gregg. The Houston Oilers coached by O.A. “Bum ” Philips ( father of Wade) were led by former Raider (Super Bowl winner) QB Ken Stabler and featured the unstoppable Earl Campbell. Any of those teams could have won the division and gone to the Super Bowl and you would not be surprised. The Cleveland Browns coached by Sam Rutigliano and lead by Brian Sipe were very much in the discussion. January 4, 1981 with less than a minute to go the ball was 14 yard line and down by two. A field goal would have given the Browns the lead against the Oakland Raiders but with the Cleveland weather being what it was Rutigliano played it “safe” by passing. Which only works if one of your guys catches the ball. It was picked off and ballgame over, Oakland wins and then destroys Philadelphia in the Super Bowl in New Orleans two weeks later. For the record the Raiders won that game indoors in the Superdome. A crowd definitely more than whatever they can fit in Philippines Arena. Bernie despite his intellect and determination could not snap the Cleveland curse. January 11, 1987. The Drive. The first event mentioned on the T Shirt. 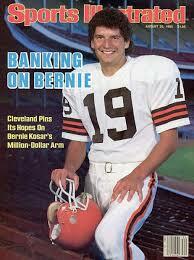 The Browns were coached by Marty Schottenheimer with Bernie Kosar at QB. Bernie played for Jimmy Johnson in Miami and kept 1988 first overall draft pick Vinnie Testaverde on the bench. Bernie was Tim Tebow if Tebow had a long career. His throws were ugly but somehow he was able to stay in the league a long time with his intangibles and getting the job done on the field. The Browns had the lead in the 4th Quarter but then John Elway and the 3 Amigos performed the legendary Drive to tie the game that they would eventually win in overtime. Two weeks later the Broncos got destroyed by Phil Simms lead New York Giants in the Super Bowl. That was not only the first ring for the NY Football Giants but also for head coach Bill Parcells and Defensive Coordinator Bill Belichick. January 17 1988. The Fumble. A year later same two teams At the half Denver lead 21-3 but Kozar responded in the second half with 4 touchdowns. Towards the end of the game , the Browns were driving for the tying score only to have running back Ernest Byner cough up the ball in what is now forever known as The Fumble. The Broncos deserved the win only to lose in their second consecutive trip to the Super Bowl to one of the most unlikely Super Bowl winners of all time. Washington QB Doug Williams was a castoff of the Tampa Bay Buccaneers and actually started that year as the backup to Jay Schroeder. He became only one of two former USFL QBs to win a Super Bowl. The MVP that day was obscure running back Timmy Smith. The final score was Washington 42 Denver 10. Game 5, 1989, May 7th. The Shot Just like the Drive was one of John Elway’s signature moments. “The Shot” immortalized another Cleveland opponent Michael Jordan. I totally forgot this game was only in the first round. The Cavaliers featured Ron Harper, Mark Price, Brad Daugherty and Larry Nance and were the East’s 3rd seed compared to the Bulls who were the 6th seed. Jordan was already a highlight film draw at that point but that Cleveland series was seen as the Bulls coming of age. Cleveland guard Craig Ehlo unfortunately earned the infamy of a thousand posters giving up “The Shot” It would not be till 1992 before the Bulls would be the last team standing at the end of the NBA season but The Shot endures. Weird stat from the 1988-89 regular season is that the Cavaliers swept the Bulls. 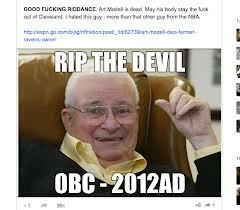 Real depiction of Art Modell demonized in Cleveland more than LeBron ever was. November 6 1995 The Move. A sports event so significant it is found on the History website. Art Modell owned the Cleveland Browns 35 years the day he announced he was moving the team to Baltimore. In the 80s Baltimore themselves were victimized by a similar exodus of their beloved Colts by Robert Irsay. They literally left March 29, 1984 “in the middle of the night like one of my ex wives ” as Slap Maxwell once said. What pinoy fans may not realize as reviled as LeBron was in 2010, Modell was still hated more fifteen years after the fact. Modell never returned to his beloved Cleveland because of death threats. Here in the Philippines there is nothing comparable in an institutional level outside of the government. Here it is road rage or politics or jealousy. The only thing that relatively comes close is the Gabby Concepcion scandal. Modell still made his impact on the league as a whole until his death in 2012. Cleveland did get their Browns back in 1999 in the form of an expansion team. Complete with a very passionate introduction by Drew Carey on opening night. I can not find full video or even a transcript of what he said but you can hear it here. The Browns since then have been mostly unremarkable. What has caused pain among the Browns faithful was that less than six years after the infamous move (January 28, 2001) their transplanted team won a Super Bowl for the city of Baltimore though only three Ravens ever wore a Browns uniform. One last Brown memory actually has nothing to do with the football team itself. The Cincinnati Bengals were playing the Seattle Seahawks Dec 10 1989. The Cincy fans were being less than hospitable to the Seahawks team and would continuously pelt the visiting team with snowballs.What happened next has always been a moment of comedy gold for me. Whether at the time or years after. Watch it here. Oct 26 1997. The World Series Game 7. The Cleveland Indians were one of the great baseball teams of the nineties. Unfortunately great does not always mean championship. They lost one of the most entertaining World Series I ever saw in 1997. While it may have been entertaining for many baseball fans without a real dog in the fight it was almost business as usual for the city of Cleveland. The classic scene of Lucy grabbing the football away from Charlie Brown does not begin to describe their plight. For a better breakdown more than I ever could read this fan’s recollection of events 11 years after the fact and how the wound cuts so deep. What adds insult to injury was who the Indians lost to that year. The Florida Marlins only threw out their first pitch four years earlier. I distinctly remember at the trading deadline that year the Marlins were doing so bad that they were wondering if they buyers or sellers. Yet they ended up with a mid season all star team with players you would know from other teams. Almost everybody who made a significant contribution to the win was sold off the following year. A rare fluke of a team that wins it all. A perfect storm. A perfect storm that victimized Cleveland. Just last week Cooperstown, New York opened its doors to Bobby Cox , Tom Glavine and Greg Maddux. They were the backbone of a devastating Atlanta Braves team that dominated the nineties. I happen to be extremely close to the only Atlanta Braves in the Philippines. I am amazed by HER knowledge of the game of baseball as it relates to the Atlanta Braves. Her knowledge of players is always against the back light of what they did to the Braves or what the Braves did to them in off season. Despite other really talented players on that Braves roster like Chipper Jones, Terry Pendleton and David Justice the Braves only won one World Series in that period of time. That was at the expense of the Cleveland Indians. Two guys two years removed from the serious Platoon totally change gears. What the real world could not deliver for Cleveland the reel world did. David S Ward was a long suffering Cleveland fan who created a movie to scratch that championship itch that was simply not to be in the 70s or 80s. 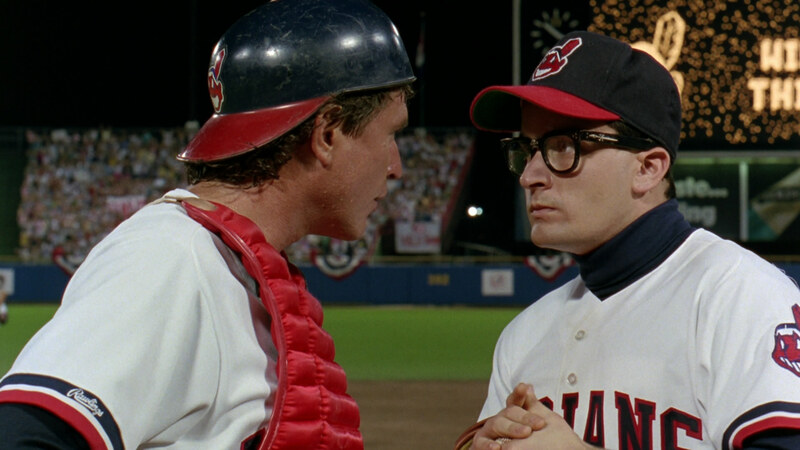 The resulting movie Major League (1989) still entertains people today. Starring two people removed from Platoon (shot in the Philippines) Charlie Sheen and Tom Berenger. Also in the cast Wesley Snipes, Dennis Haybert (24) , James Gammon (Cabin Boy) Corbin Bernsen (LA Law) and Rene Russo (Lethal Weapon 3) . One wonders if whatever curse there was on Cleveland was extended by all the make believe winning in this movie. The Decision July 8 2010. You ever watch movies or TV shows where the evil jailers mean to mentally torture prisoners they are interrogating by giving them a little hope then taking it away? That was my big problem with The Decision 2010. It was like breaking up with your high school girlfriend while introducing her to your new girl friend who is richer and whose looks seem attributed to the Belo clinic. All while you speak into a microphone in front of the whole school. When a player decides to move that is fine that is their right. LeBron happened to be the best player in the draft that year and for many years when his own home town won the NBA lottery. I just did not like that when it was time to exercise his free agent right he does it in such an in your face fashion. And the sports gods all decided that this 7 year confluence of events happens to Cleveland. Who else? The Return July 12 2014 My suspicion was that most pinoys before reading this just knew Cleveland as the city began his NBA career with. They might not have known the baggage that Cleveland has to deal with for decades before they even knew who LeBron James was. Now that the overall context of the sports culture has been somewhat explained the words in “The Letter” where LeBron explains why he is returning can make more sense to people not familiar with the sports scars of Cleveland. Miami has already won three rings in the Wade era. One ring for Cleveland might equal eight more rings in Miami. If you want to feel even more dramatic about it listen to the same LeBron letter as if read by Morgan Freeman. Next Article People constantly fiddling with their phones are such eyesores! Thanks for all those trivia, very informative, I enjoyed reading. 1. Coverage for political circuses and expediency. Nuisance candidates get elected because money talks. 2. Trial by publicity, black propaganda character assassination and even manipulated surveys. Lack of ethics is apparent. 3. Paid hacks in media for hire presstitutes. 4. Nonsense entertainment without values, scruples, morals or truth. 5. Paid propaganda of the present dictatorship allowed in even demolition jobs, character assassination and vilification. 6. Lack of truth in even advertising. 7. Use of lies, falsehoods and deception in matters of altered history by making opportunists look like heroes. I wrote it.I say what it is about. It is about the backdrop of the return of LeBron. Why it is significant to the city of Cleveland as opposed to Miami or any other NBA city.